Durante la semana pasada en nuestra ruta por India y antes de llegar a Agra para visitar el Taj Mahal, hicimos parada en la ciudad fantasma de Fathepur Sikri, abandonada por sus habitantes por escasez de agua hace unos cuantos siglos ya… El escenario era perfecto para fotografiar el look cómodo y fresco, que aquí se hace obligatorio a más de 35º de temperatura. 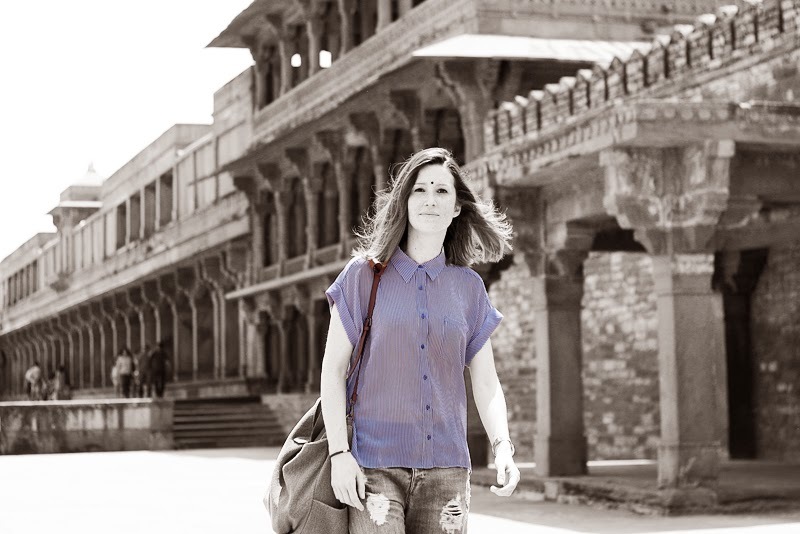 Last week when going round in our trip to India and before arriving to Agra to see the great Taj Mahal we stopped at the phantom city of Fathepur Sikri, abandoned by its citizen some centuries ago because of the shortage of water. The scenario was perfect to shot a comfy and fresh look, mandatory in here under 35º of temperature. new look on my blog and new look on my hairstyle! Menuda envidia! Que pasada de fotos. Fantastic place and pics, you're pretty! what an incredible location! Love the backdrop and your casual dressed down style here is super cool.